The Saint Louis University Athletic Training Program hosted its 5th Annual Speaker Series and Recognition Ceremony on Monday, February 15 at 7:00pm in the Huh Auditorium at the Center for Global Citizenship. The event was presented by the Saint Louis University chapter of Iota Tau Alpha - the Athletic Training Honor Society - and supported by the SLU Student Government Association. The evening began with the 2016 initiation ceremony for the SLU Alpha Iota Chapter of Iota Tau Alpha, the National Athletic Training Honor Society. 2015 Iota Tau Alpha honoree Madeleine Bresnahan was also recognized at the event because she was studying abroad in last Spring. Scholarship award winners Dustin Jamboretz, Rachel Spika and Demeisha Crawford were also recognized. Then, Dr. Fred Pestello, SLU President, made introductory remarks and welcomed attendees. The keynote speaker for the event was R. Mark Laursen, MS, ATC, a Clinical Associate Professor of Athletic Training and the Director of Athletic Training Services at Boston University. #BostonStrong: Our Journey 2012-14, Boston University's Experience with the Boston Marathon. Mr. Laursen discussed his experience as a health care provider in the 2012 Boston Marathon and during the 2013 event, where a terrorist attack resulted in two pressure-cooker bombs being detonated near the finish line of the race. Three people perished and over 250 others were injured in the attack. Both immediately following the tragedy and in the years that followed, Boston University played a substantial role with the marathon and in the Boston community. Factors were discussed that affected the support that was provided for those affected. 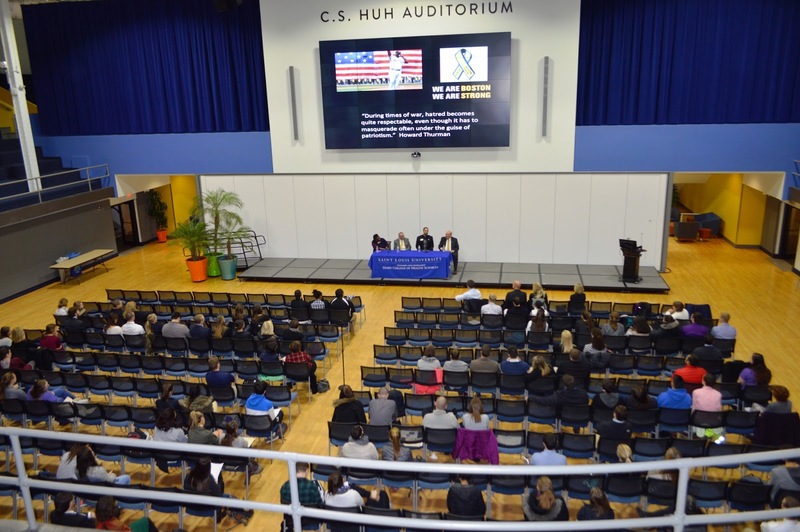 Following the keynote presentation, there was a panel discussion addressing how Saint Louis University would respond to a comparable tragedy. The panel included: Mark Laursen, SLU Dean of Students Mona Hicks, Ed.D. ; SLU Campus Minister Fr. Robert Murphy, SJ, DPT, ATC; and SLU Psychology Professor Michael Ross, Ph.D. This event was a truly moving and memorable experience!